PQI offers the most comprehensive selection of ultra-efficient and harmonic mitigating transformers in the industry. This variety allows designers to match our products to the specific requirements of each application. Our Type EY e-Rated® transformers are an easy choice for building owners looking for energy-efficient solutions with exceptional performance even in lightly loaded settings such as schools and commercial buildings. Because most distribution transformers are loaded less than 35% on average, we designed our e-Rated® transformers for extremely low no-load (core) losses with an advanced full and step-lap, miter-cut core design with grain-oriented silicon steel. While we primarily supply transformers less than 600V, our ultra-efficient and harmonic mitigating products are also available at medium voltages. For installations in harsh or polluted environments, our cast coil transformers offer high-performance, low-maintenance costs, and protection from short circuits, momentary overloads, impulse voltages, and temperature fluctuations. For specialty or custom transformers, please complete the form to the right and one of our representatives will connect with you shortly. While we typically advise using our ultra-efficient or harmonic mitigating transformers, we realize general purpose transformers might be acceptable for owners focused solely on cost or for projects involving a mix of transformer types. Our general purpose, Type T transformers meet NEMA TP-1 efficiency requirements, are cost competitive, and are backed by our industry-leading, 10-year warranty. PQI has developed a proprietary computer program that calculates transformer excitation and impedance losses under any linear or nonlinear load condition. The primary outputs of this calculator include annual savings, payback, and return on investment, which are based on the load’s harmonic current profile, cost of power, and loading. The PQI Calculator™ allows for a side-by-side comparison of two transformers, each having the same or different kVA and voltage ratings, under the same or different harmonic current profiles, and at any load level. 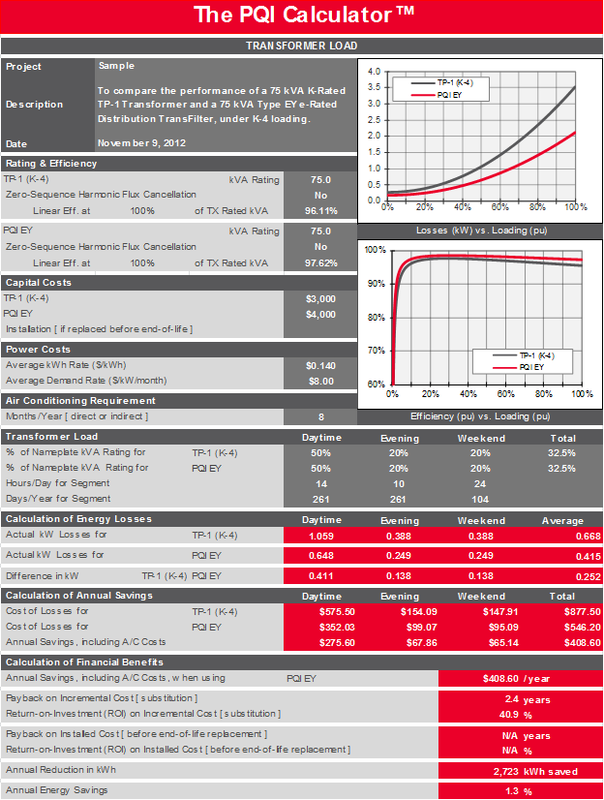 It is important to recognize that the annual energy savings, ROI, and payback, calculated by The PQI Calculator™, are based on transformer performance in isolation. The application of our harmonic mitigating Distribution TransFilters™also reduces current and voltage distortion in the remaining elements of the electrical distribution system, which can dramatically increase energy savings. We consider these less obvious savings, as well as other factors such as reduced downtime and increased equipment life, when evaluating the specific circumstances of each project as part of The PQI Solution™.